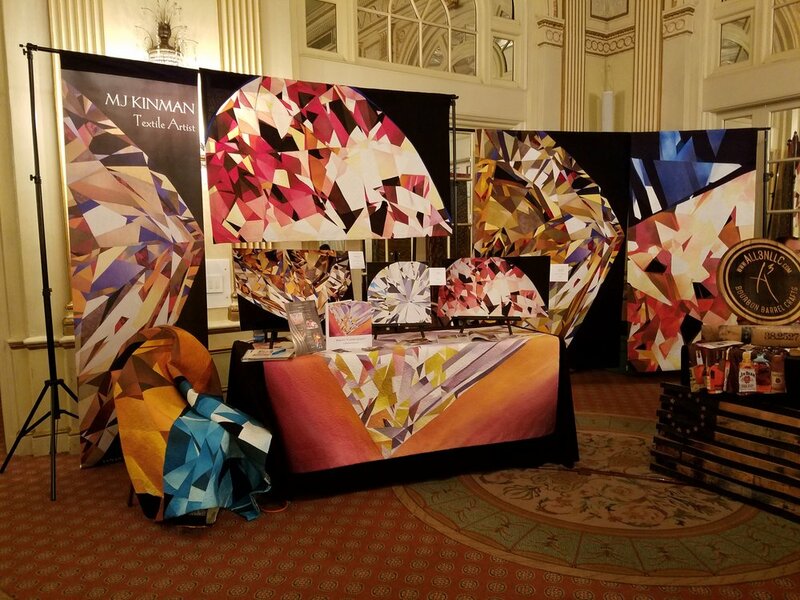 Rob Samuels was standing in front of my Bourbon Diamonds display at the Bourbon Women Association's "Sip-osium" in 2017 when he said, "You know, we have dozens of artists who exhibit their artwork at our distillery." I knew this was going to be an interesting conversation. My Bourbon diamond display at the August 2018 Bourbon Women Association's "sip-osium"
Rob is the COO of Maker's Mark Distillery (Loretto, KY), the next generation to lead the helm at the iconic bourbon maker located in the heart of Kentucky. We chatted for a few minutes and I handed him a folder containing my portfolio, bio, and other information. A few weeks later Rob called to ask if I would be interested in submitting a proposal to create a piece that would be displayed over the fireplace at their restaurant, Star Hill Provisions, and invited me to visit the distillery to find inspiration there. 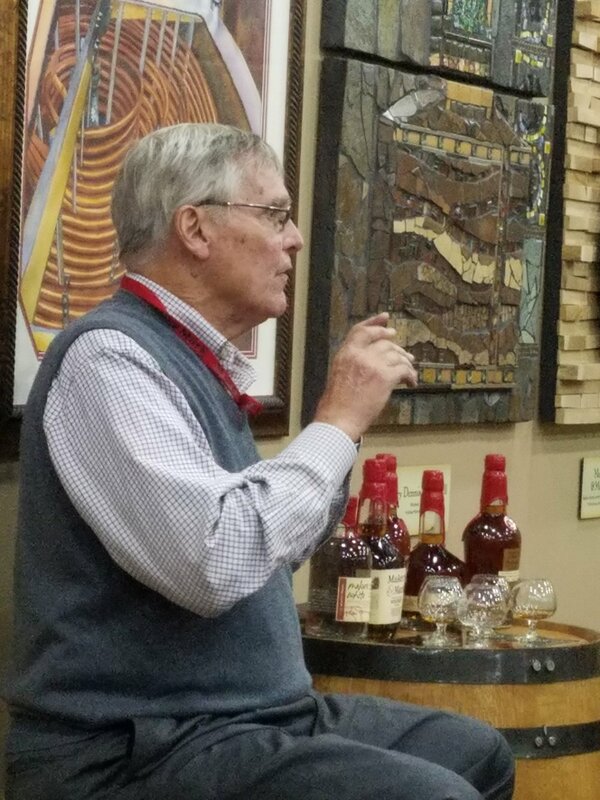 When I visited Maker's Mark in late September, about 15 of us spent the morning trailing after Bill Samuels, Jr, taking in his every word. Bill Jr took the reins of the company after his father retired. Bill Jr set the company on a trajectory that propelled it to worldwide fame. 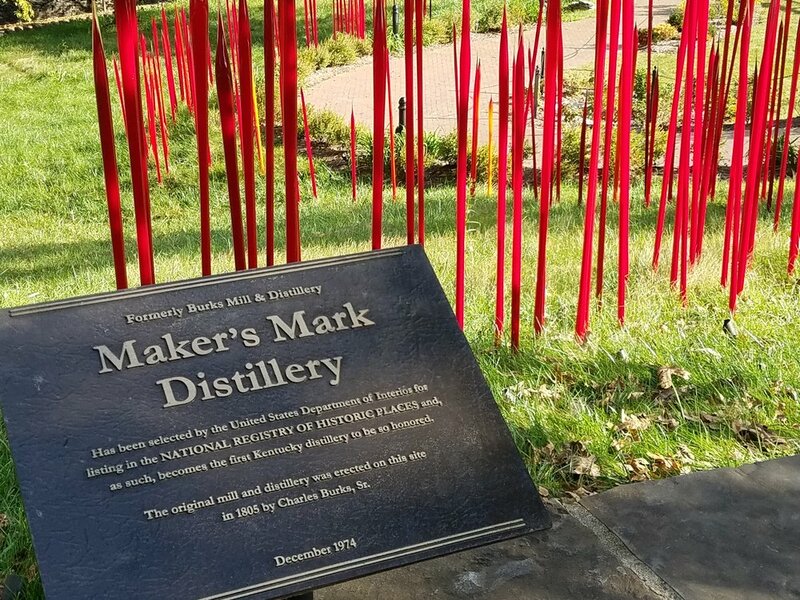 Partly through smart business decisions and partly through ground-breaking PR and advertising efforts (including brilliant advertising campaigns), Maker's Mark is now one of the most recognizable brands in the world. At the end of the tour, we joined Bill Jr. in the tasting room, sampling bourbon and learning from the best. 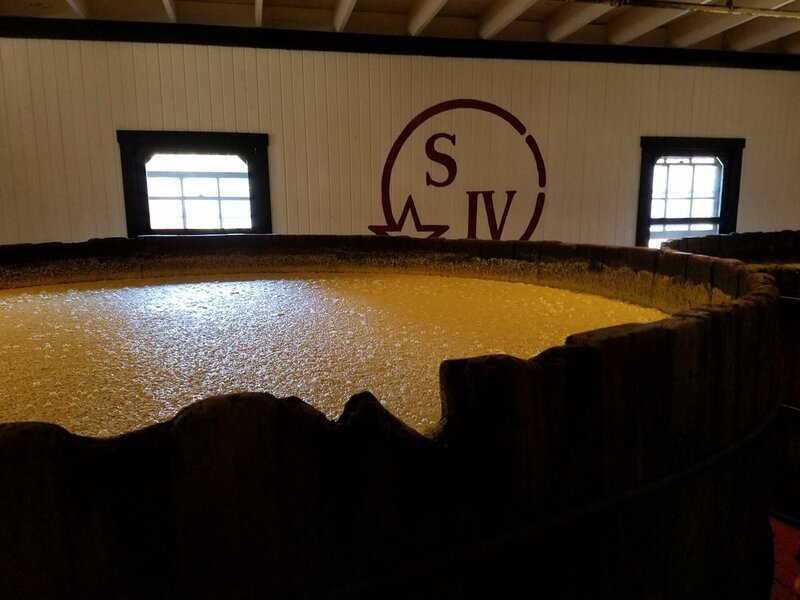 Images below: Bubbling mash in old cedar fermentation vats; tasting Maker's products with Bill Jr; Your's-Truly and Mr. Samuels; the Good Stuff! It struck me that the symbol of fire plays a large part in the Maker's legacy. When Bill Sr decided to revamp the family company into a truly new brand in 1954, he held a little family ceremony to burn the old mash bill (the grain recipe that when fermented produces the distillate that will eventually become bourbon). Just as he tossed the burning paper into an old copper pot, his little daughter jumped up to look inside. Her hair caught fire and chaos ensued. And of course you can't make bourbon without setting new oak barrels on fire. 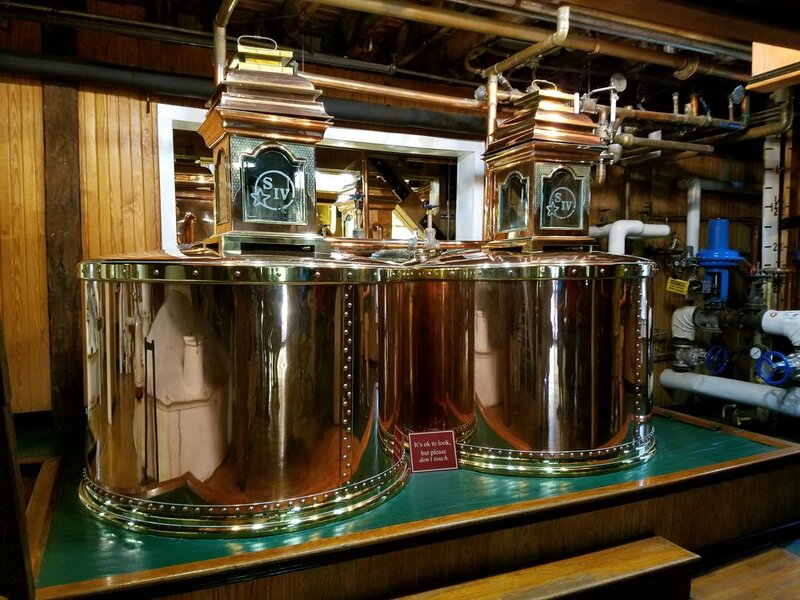 Allowing the distillate to seep in and out of the toasted and charred wood over a period of years adds color and flavor to the alcohol and removes impurities that can taint the flavor. Finally, the symbolism of passing the torch from one generation to the next is evident throughout the Maker's Mark history. Bill Jr took the company his father built and launched it to greater fame. Now Rob, Bill Jr's son, has his own unique vision for expanding the brand, including making the fine arts a signature feature of Maker's Mark. I took what I learned about the Maker's Mark history and transformed it into a design that honored the fire symbolism that infuses its legacy. I found a lovely tear-drop topaz and manipulated it through Photoscape to create a shape that could be viewed either as a fire-infused drop of bourbon OR a bourbon-infused flame. The Samuels family logo hovers in the upper right background eliminating any doubt as to whom and what the piece pays tribute. Images below: The top of the Maker's Flame mock-up; Star Hill Provisions Restaurant wall for which the quilt was designed; the lower half of the Maker's Flame mock-up; the proposed design superimposed on the architectural elevation of Star Hill Provisions fireplace wall. 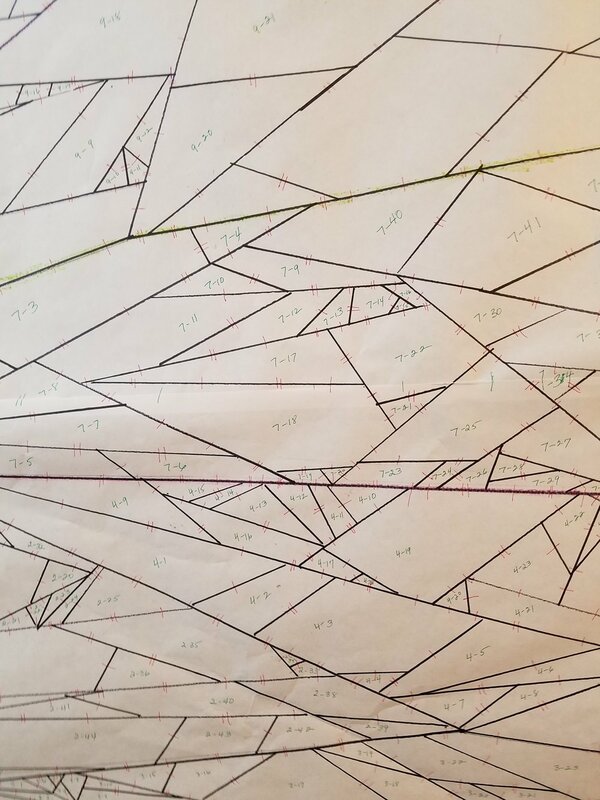 Back in my studio, I drafted the 9' x 4' freezer paper chart and applied the codes to each facet. 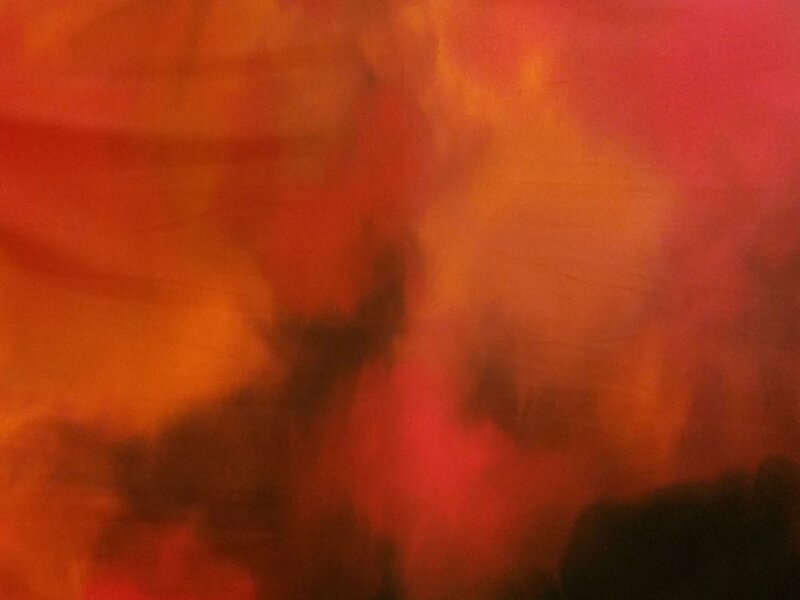 One of my favorite parts of the process is painting fabric. It's wild and messy -- so unlike the very precise and premeditated nature of the rest of the process. I use Dye-Na-Flow fabric paint produced by Jacquard Products. You can use it just like a watercolor paint, it doesn't change the "hand" of the fabric, and it is permanent once heat set. Once I had the template completed and fabric painted, I sliced up the template, ironed each of the nearly 900 pieces to fabric according to its color code, cut them out with a 1/4" seam allowance, and pieced them back together. I batted the quilt with The Warm Company's Warm & White bat. 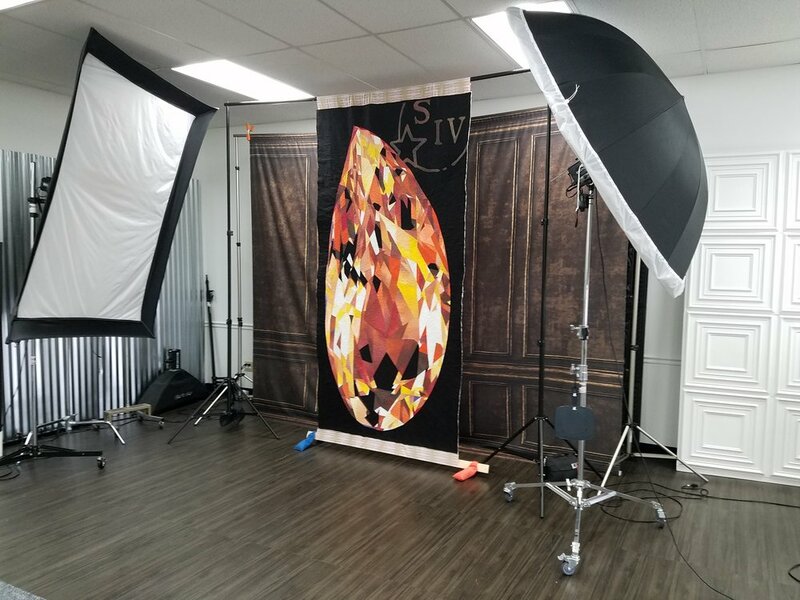 And the last step was to quilt the 36-square-foot quilt with a random, non-directional quilting pattern I've developed for my diamonds. I call it "wild-motion" machine quilting. I use Sulky's 100% viscose thread in both the needle and the bobbin. Sulky thread simply glows on the surface of my quilts. The entire construction process took about 10 weeks. 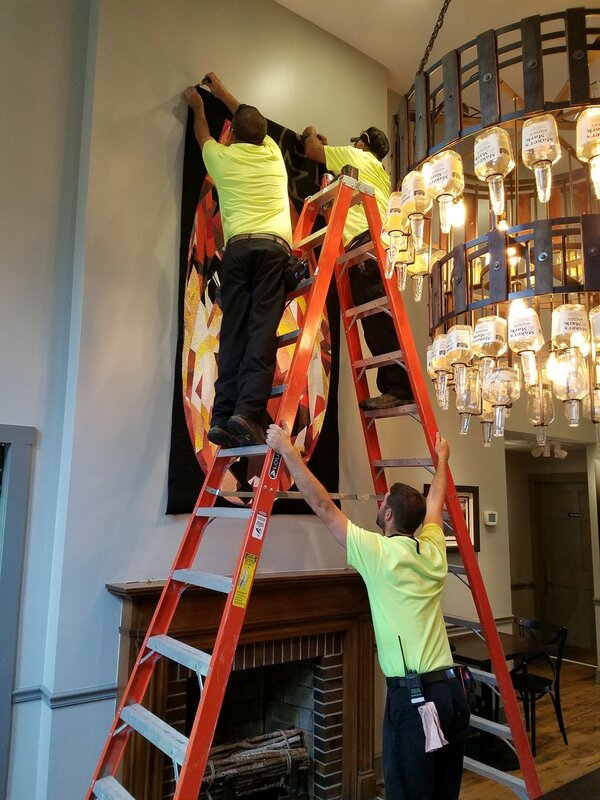 Maker's Flame was installed August 21, 2018, in the Star Hill Provisions Restaurant. 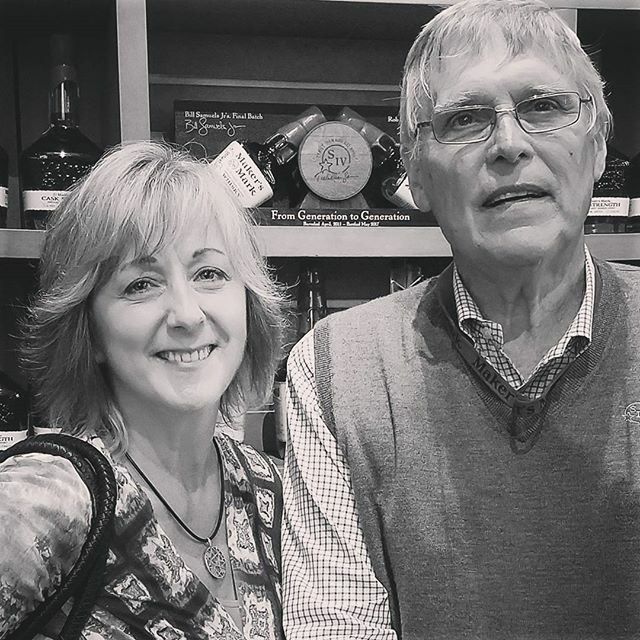 Next time you're visiting Maker's Mark Distillery while on your Bourbon Trail adventure, stop in and say "HI" to her! My thanks to Rob Samuels for his faith in my artistry. I am honored and humbled to have one of my art quilts included as a permanent part of the Maker's Mark art collection. 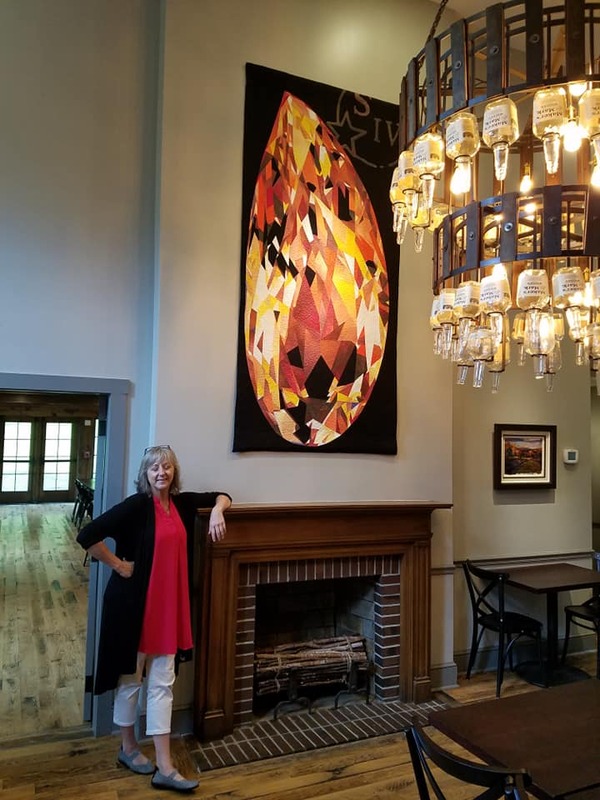 My thanks also to Rob's fantastic staff, Kim Ries, Sydina Bradshaw, Roy Lee Wigginton, and the crew who took such good care of it as they hung it in Star Hill Provisions restaurant. My appreciation also goes to Dan Burgess and Bob Lauder at Doe Anderson for their help in getting the word out. I've also been able to personally thank Peggy Noe Stevens, Susan Riegler, Audrey Petty and other founders and leaders of the Bourbon Women Association for bringing this opportunity into my life. By allowing me to exhibit my work at their 2017 Sip-osium in Louisville, I was able to connect with Rob and obtain this amazing commission. Thanks, all!